Tom Manion; musician, artist, engineer and producer, with over 40 years of combined experience in the music and film industry is bringing his knowledge and experience to a local level by opening WOODSOUND STUDIOS in Covina. “Over the years I’ve worked with artists from some of the top bands in the world. Artist from bands like the Doobie Brothers, Chicago, Guns and Roses, Rod Stewart band, Aerosmith, Five for Fighting, The Who and hundreds of local bands. Hip Hop bands, punk bands, metal bands, pop rock bands, classic rock, blues bands. I have always wanted to open a pro studio. So I opened a studio that does rehearsals and recording. And is pro yet can still be affordable for the local bands "WOODSOUND STUDIOS".I grew up in Covina and we never had a place to jam where the people next door or down the street wouldn't call the police because of loud music. Well now Covina can jam out and the people living next to you won't come pounding on the garage door. The rooms are double walled so the band in the next room won't sound like they are in the same room as you. So if your working on a college project or your church band, or your own band Woodsound Studios is here for you. 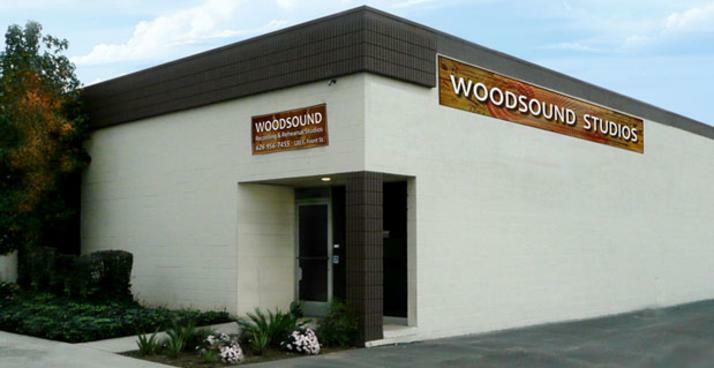 Located in Downtown Covina just south of the Metro Station at 120 E. Front St. WOODSOUND STUDIOS offers professional recording and rehearsal studios that will fit within any bands budget. A recording studio for audio recording services. And professionally engineered with state of the art equipment. As well as rehearsal studios that allows you to rehearse and prepare for your next gig, recording session and/or interview. Let me help you with your next project. "CALL ME", for a booking (626) 956-7455.